Tap... tap... tap. May I have your attention please. I'm in need of a little clarification. Why the heck would the people at Topps think collectors would want an autograph of this guy? Maybe it's because there are collectors like myself who have nothing better to do, than to build this ridiculous set consisting of Alan and his female companions. 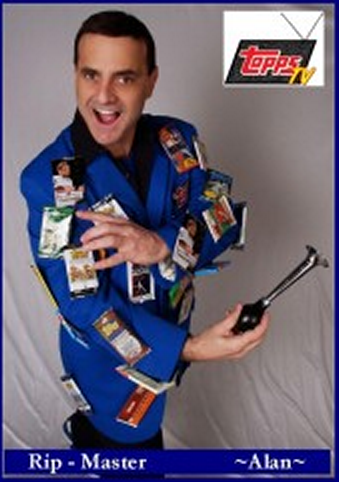 If you're not familiar with the guy, he's the annoying host of Topps TV's The Rip Party. I'll admit, there was a time when I actually would sit down and watch the videos... but it wasn't to see him, I assure you. 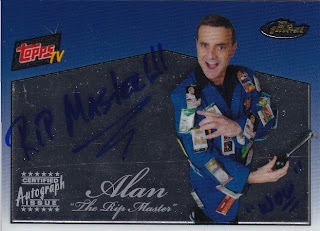 But then I hit a wall... and the 2008 Finest "Topps TV Autograph" set project went into hibernation. 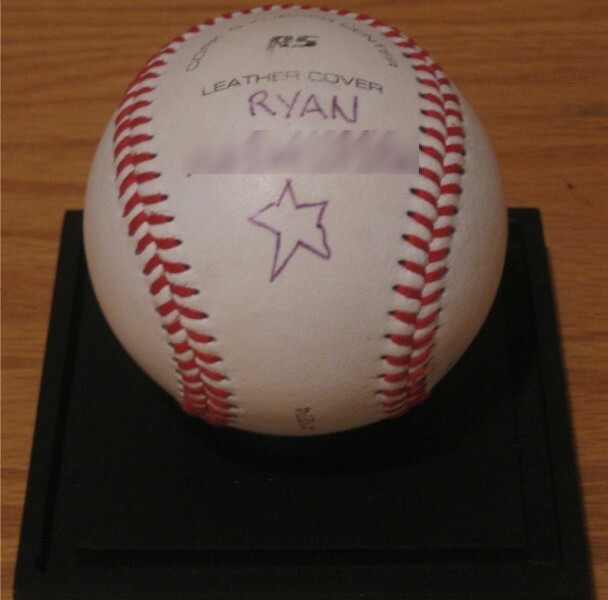 I attempted to purchase Rachael's autograph a few times, but wasn't willing to spend the kind of money people were asking. Is this the most ridiculous set ever produced? If not... what set is? Happy Thursday everyone... and sayonara! Last week... I asked you guys about your favorite oversize cardboard sets. Chuck's Used Cards & The Shlabotnik Report both mentioned the 1964 Topps Giants set. What's so special about 1964 Topps Giants? Isn't it obvious? They're huge. They're oddballs. And they're simple & attractive at the same time. Why Rocky? Well... 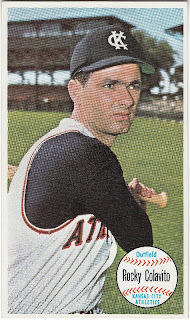 I knew I wanted a member of the Kansas City Athletics and discovered there were only three players to choose from: #9 Rocky Colavito, #15 Jim Gentile, and #45 Wayne Causey. 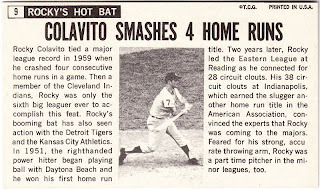 Colavito was the only player I had heard of, so it wasn't too difficult of a decision. 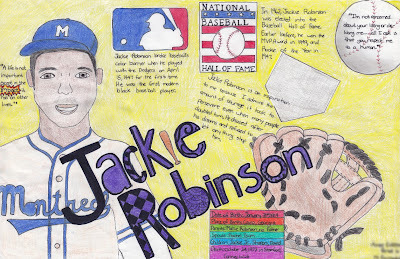 Known primarily for his years with the Cleveland Indians, he played for Kansas City in 1964. 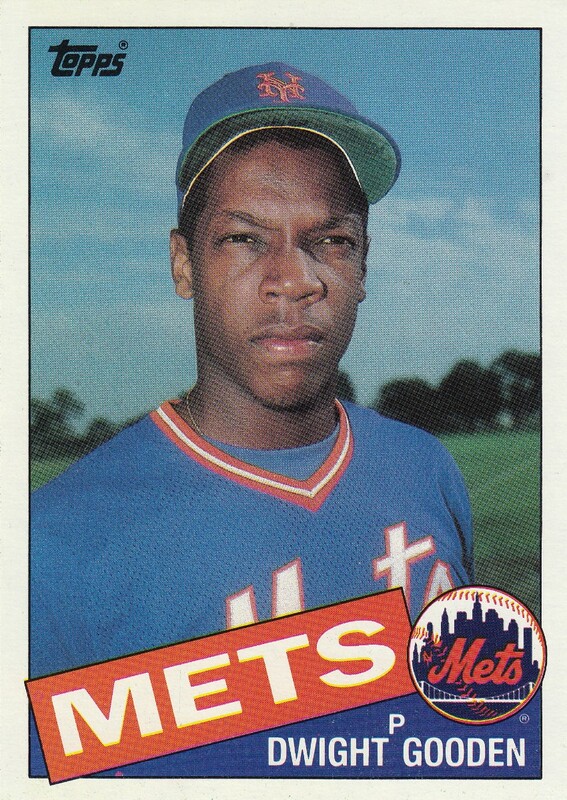 That year, he hit 34 home runs, batted .274, scored 89 runs, drove in 102 RBI's and was a member of the AL All-Star team. 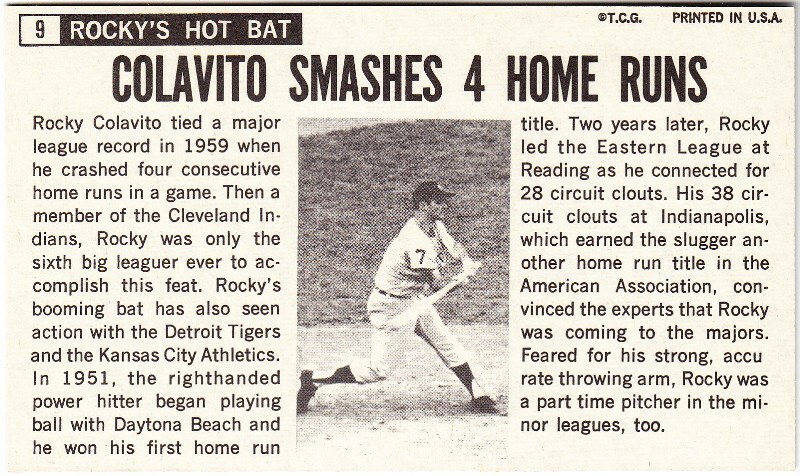 By the time he wrapped up his 14 year career in 1968, he managed to hit 374 home runs. Why this particular card? I had a bunch to choose from and some of them were cheaper than this one. But in the end, I chose this card because it was in really good condition, had decent centering, and was reasonably priced. The card was $4 (free shipping) and looks like it was pulled from a pack yesterday. Thanks Chuck & Joe for your suggestion. Without it... I wouldn't have added this card to my collection. Share some of the players you enjoy collecting... even though they'll never be enshrined at Cooperstown. Who knows... your response just might lead to another one of my cardboard purchases. One Down... Two To Go! Seventeen months ago, I started building the 2008 Upper Deck Masterpieces Captured on Canvas set. It was simply love at first sight with these cards. 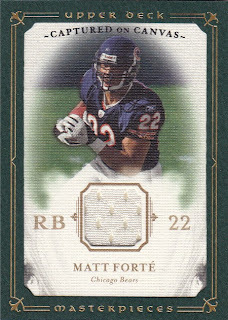 I know that "relic", "memorabilia", and "game used" cards aren't as popular as they once were... but a sweet looking card is a sweet looking card. It started with me buying a case of this stuff. C'mon... you remember the whole Joe Montana debacle. I was able to pull a high percentage of the cards I needed for the set. From there, I turned to purchasing "lots" off of eBay. And when I narrowed it down to 8 or 9... I started to pick them up anyway I possibly could. Unfortunately, I've been stuck on three for a few months now. Until a couple of months ago when I saw a guy selling the Matt Forte for $5. Well... here's the thing. I refuse to overpay on these cards... especially when it's "event worn". So I offered him $2.50, which I felt was fair. But he refused. Fast forward to last week. I noticed that he hadn't sold the card. So I threw out the $2.50 offer again. And again, I was denied. Anyone out there have either of these cards for sale or trade? If so... let me know. I'd love to wrap this project up. Have you ever been turned down, only to find a better opportunity just around the corner? Happy Friday everyone... and sayonara! It's not common for me to go to ballgames during the work week... but then again... it's not often you'll see me pass on free tickets. The San Jose Giants are always giving away free tickets and last week I picked up a pair for Thursday night's game. My friend Denise, who's a huge San Francisco Giants fan had mentioned a while back that she had never attended a San Jose game, so I brought her along for the ride. 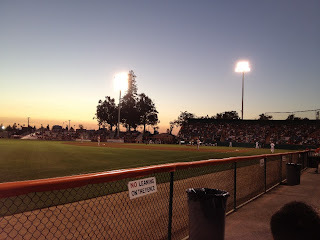 The game itself kind of sucked, because the Giants fell behind early to the Visalia Rawhide and were never really in it. We were looking forward to watching Joe Panik play. 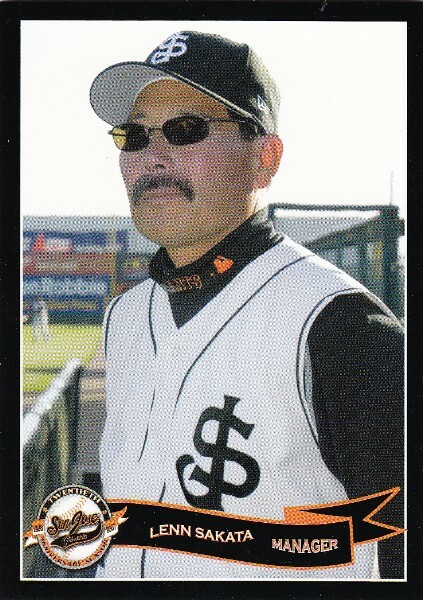 If you're not familiar with Panik, he's their starting shortstop and was San Francisco's #1 pick in the 2011 MLB Draft. Unfortunately, he was 0 for 3 at the plate and had a costly error that allowed a run to score. On the flipside... our seats were great, the BBQ was tasty, and I was able to pick up a few things for the collection. Usually, I'm a bargain shopper. But since the tickets were free, I figured I'd dig into the pockets to support the local team. 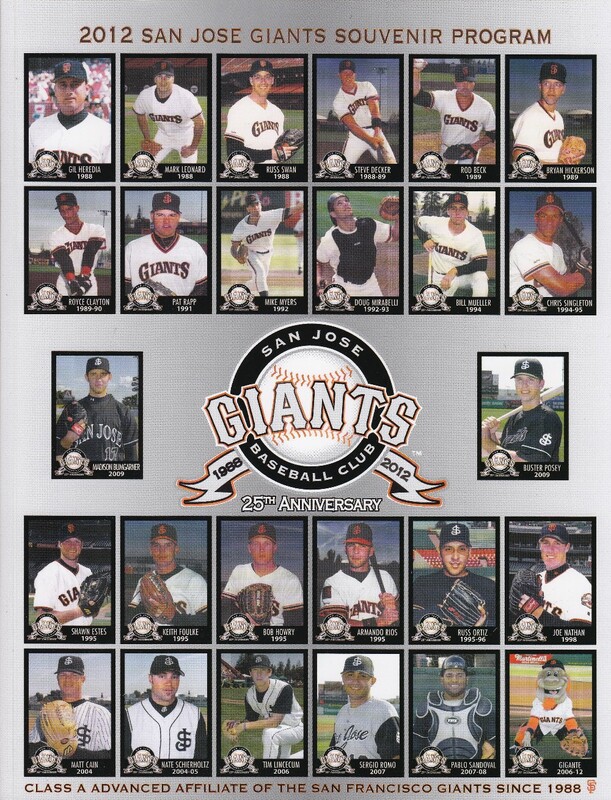 The SJ Giants have been around since 1998 and this program celebrates their 25 years in the city by featuring a collage of former players such as: Tim Lincecum, Buster Posey, Royce Clayton, Steve Decker, and Shawn Estes. I'm a huge fan of these helmets. Normally they come with an ice cream sundae. But they ran out of ice cream by the time I got there. Anyways, I asked if I could get a helmet and the lady told me she sell it to me for $4. The ice cream sundae costs $4.50. Yep... I know I got ripped off. But that's how badly I wanted this helmet. 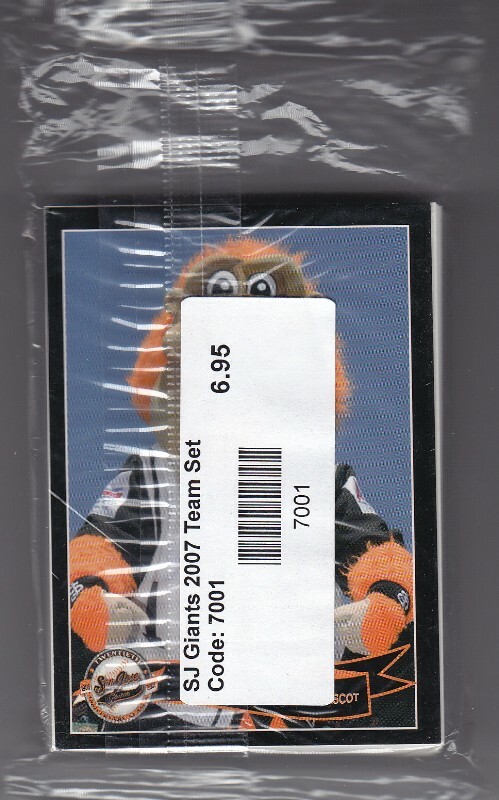 I really wanted to buy the 2012 set with the Panik, but $12.95 seemed a little overpriced. 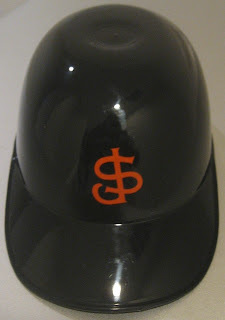 And since I already overpaid for the mini helmet... I figured I'd go with their most affordable trading card set. I'm not sure if the set is actually worth the $7, but there are a couple of cards I really like. 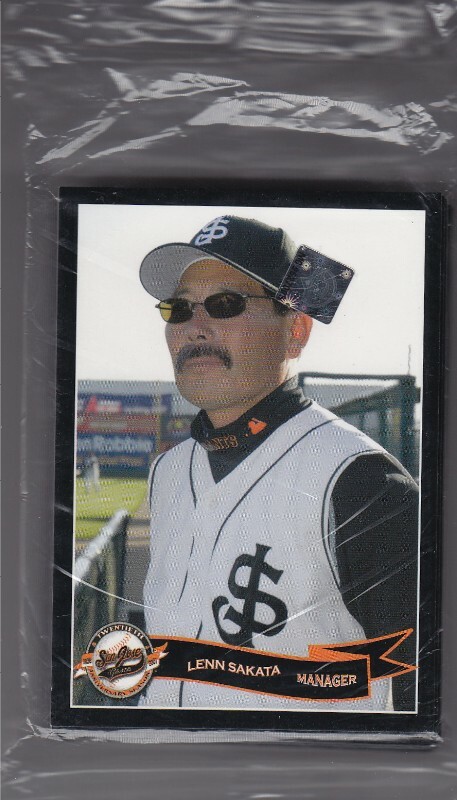 In 2007, Sakata became the winningest coach in California League history. But that's not why I'm a fan. These days, Japanese players are a minority, but aren't exactly rare. However... back in the 80's... Sakata was the only player I knew with a Japanese name. He wasn't exactly a star... but it's a name that serves as a constant reminder of my childhood. Speaking of Japanese players... how about that Kotaro Kiyomiya? 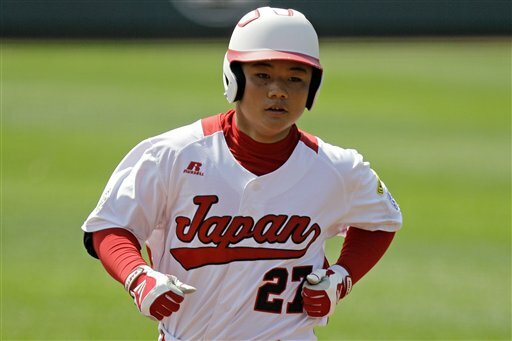 The 6 foot man-child hit two home runs today against Panama to help send Japan to its third championship game in three years. I'm hoping Petaluma pulls out a win against Tennessee this afternoon, so that we'll be able to see Kiyomiya face off against the 6'3" Bradley Smith. Okay... time to watch the U.S. Finals. Go Petaluma! Outside of cardboard, I have another addiction: Haribo Gummi-Bears. I routinely buy their five pound bags from Costco and follow a very, very strict routine. I always... and I mean always save the white bears for the end. And as I draw closer and closer to those remaining "pineapple" flavored bears, I eat less and less so that I can enjoy the delicious pieces of candy for as long as possible. Then... when there are only white bears left... I divide them into five or six zip lock bags and the countdown begins. 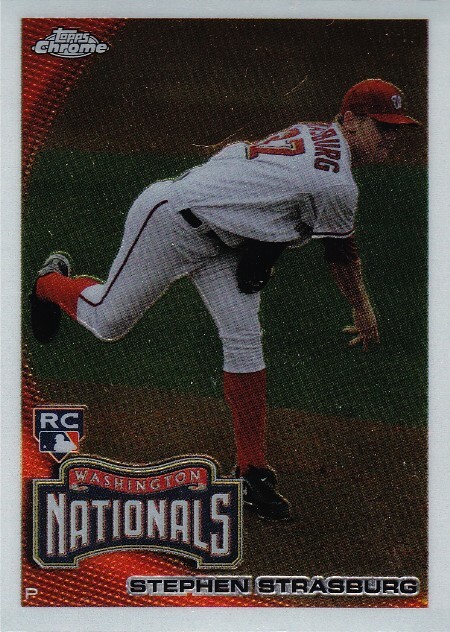 So, when fans and collectors of Stephen Strasburg frown upon the Nationals' decision to shut down his season after a certain number of innings... let's just say that in a way... I understand. 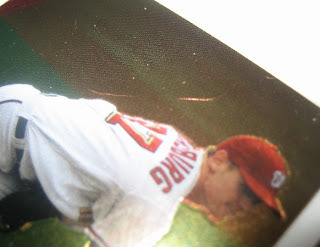 If you look closely, you can see two small creases running across the top of Strasburg's back. This card is actually pretty special to me, because it was given to me by my nephew. 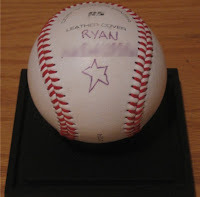 He gave it to me the same day he gave me the autographed baseball a few months ago. He's still at the stage where he throws his cards on the floor and sorts them into teams without thinking about condition or future value. Dang... what I wouldn't give to go back to those days. The days where I owned my possessions and my possessions didn't own me. Well... at least I've found a way to appreciate the damaged cards in my collection. Set Showcase #23: 1998 Ultra "Kid Gloves"
Well... 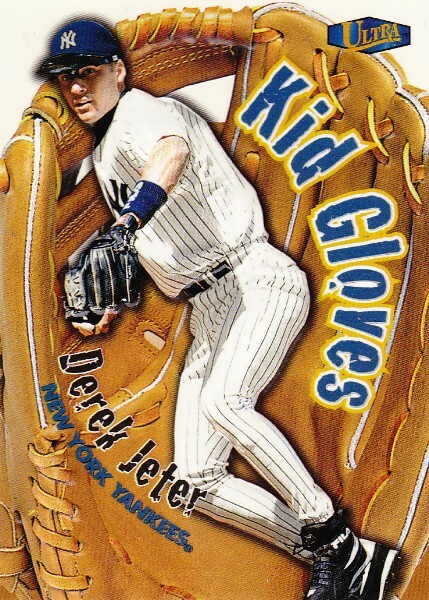 I found someone selling their complete 12 card "Kid Gloves" set on eBay and threw out a bid and ended up winning the auction for $3.99 (free shipping). Yep... that's 25¢ a card. 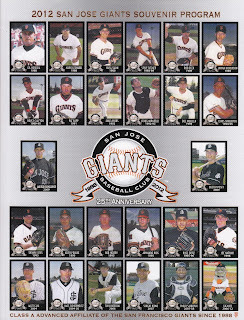 You gotta love overproduced, cool looking 90's insert sets. Here's a closer look at the set breakdown. #7 Scott Rolen, #8 Nomar Garciaparra, & #9 Jose Cruz Jr. 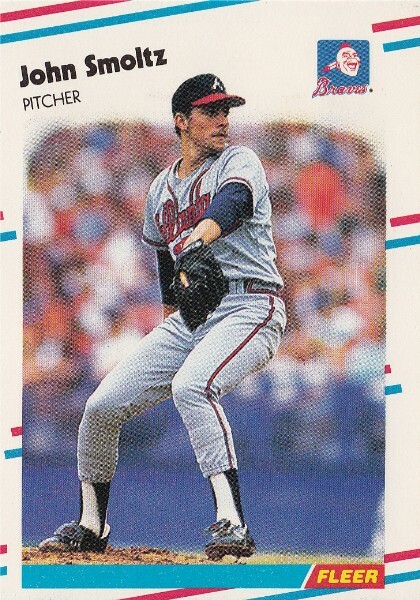 I'm a huge fan of the card's design, because it features an embossed glove with a photo of the player in their defensive stances. They were seeded into one out of every eight hobby packs, so they weren't rare. But they're still cool looking cards. Currently none of the players are enshrined at Cooperstown. But I'm pretty sure we'll be seeing embossed bronze plaques of Jeter, Rodriguez, Jones, and Guerrero within the next decade or so. 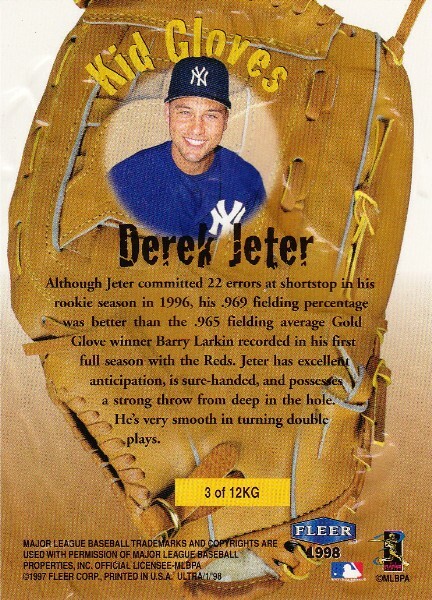 Derek Jeter is the most valuable card in the set... listed at a whopping $4. A-Rod and Nomar are both listed at $2.50 each, while Chipper and Vladamir round things out at $1.50 a piece. I only found one completed sale for this set... my $3.99 purchase. However, I've seen sales for as little as 35¢ (shipped) for a single Walker and as high as $5.94 (shipped) for a single Jeter. There's currently a complete 12 card set up on eBay for $4.99 (+ $3.00 shipping), so we'll see if somebody pulls the trigger and picks up this set. Today's question is about the 1997 AL MVP and 6x MLB All-Star... Mr. Nomar Garciaparra. Do you think he'll eventually be enshrined in Cooperstown along with some of the other big names in this set? Why or why not? Happy Monday everyone. I hope all of you have a great week. Sayonara! A few weeks ago, 30 Year Old Cardboard celebrated it's fourth birthday and decided to giveaway some cool prize packages: a Jim Palmer lot, a Barry Larkin lot, a John Smoltz lot, and a Eck & Molitor jersey card lot. All five of these cards are going straight into my personal collection. 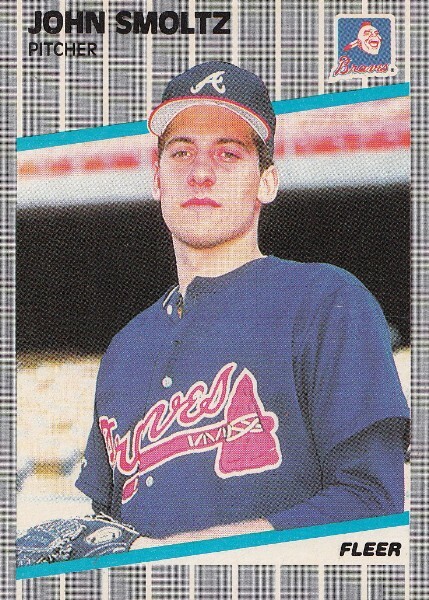 In fact, I'm actively pursuing Smoltz's three other rookie cards (1989 Upper Deck, 1989 Bowman, and 1989 Score) along with a certified autographed card, so he can become a member of my Sports Card Trifecta PC. Happy 4th Birthday 30 Year Old Cardboard! 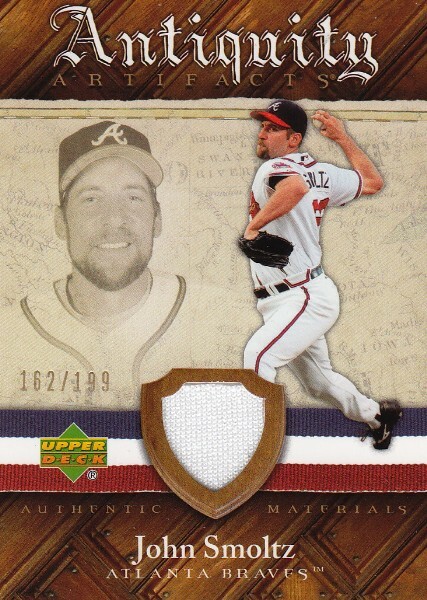 And Brian... thanks again for helping me kick off my John Smoltz collection. I'm sure if you're a reader of my blog, you're already following 30 YOC. But just in case you aren't, I encourage you to head over there right now. He's definitely in my blogger hall of fame. His dedication is matched by only the greatest in the hobby. If you're not reading his stuff, you're missing out. So what are you waiting for... click here to head over to his blog. Bigger is better! Bigger is better! Bigger is better! This lengthy piece of cardboard measures a whopping 5" x 7"... which is much bigger than your average piece of cardboard. However... outside of size, it's hard to tell the difference between the fronts of the regular issue Gooden and his oversized counterpart. But there are a few differences between the two cards on the back. First, they're numbered differently. 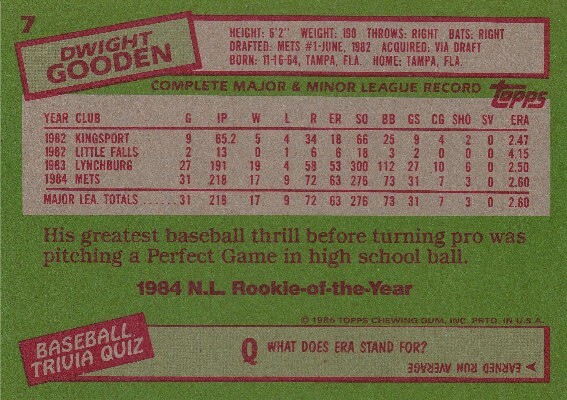 The quality of ink also separates the two cards and finally, Topps decided to add 1984 N.L. Rookie-of-the-Year to their super-sized version. Anyways Princess... I promise to buy us a bigger bed if you'll take me back. That's what you were talking about... right? What are some of your favorite over-sized cardboard sets? Honestly... I had never heard of the guy and felt a little stupid since he was the 1965 American League MVP. 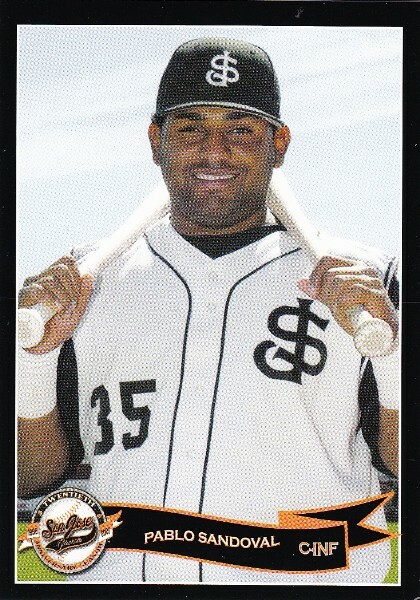 That season, he led the league in runs, doubles, triples, and total bases as he helped the Minnesota Twins reach the World Series for the first time since their move from Washington several years earlier. Anyways... I was so surprise to learn this little piece of trivia, that I headed over to Check Out My Cards to search for the 1965 Topps card captured on the K-Mart card. Unfortunately, I couldn't find one. 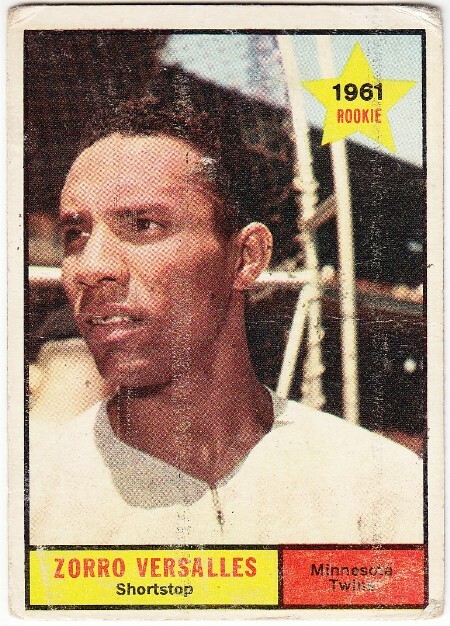 But I did find his 1961 Topps rookie card, which I found for 60¢. 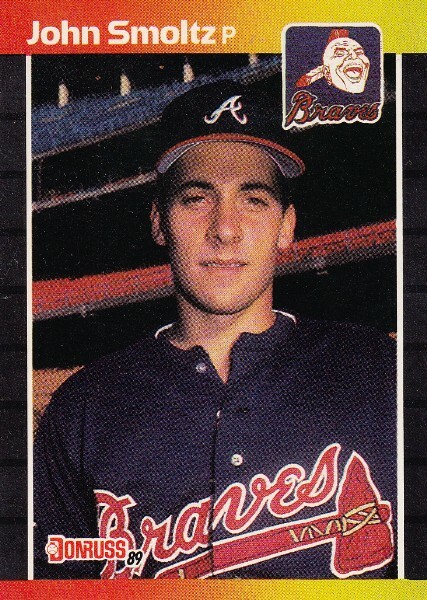 It's not in perfect condition, but it's still the rookie card of a former AL MVP. Best of all... it's evidence that one piece of cardboard often leads us to another piece of cardboard. 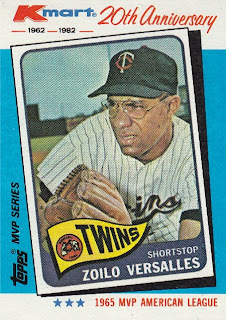 Have you ever heard of Zoilo Versalles before today? Who are other MVP's (from any sport) that people may not have ever heard of? Happy Hump Day! Enjoy the rest of your week and sayonara. Every February, my school celebrates Black History Month by having the students research an individual they admire and consider to be an important figure in our country's history. When they're finished, the students choose one of the following: write & present a speech, write a report, or create a poster of their person. 95% of the students choose to create a poster. It's pretty amazing the amount of talent that passes through my classroom each year. There's simply not enough space on my classroom walls or blog page for that matter to show it off. But the poster at the top of this post is special, because it was a gift from one of my students who knows I have a deep admiration for Mr. Robinson. You might be wondering... why didn't you show this off in February? Well... I actually misplaced it and discovered it buried in a stack of papers on my desk while I was cleaning my classroom this morning. So Aimee... if you're reading this. I apologize for the delay, but thank you very much for this poster. By the end of the week, I should have it framed and hanging in my office @ home. Everyone else... have a great week! In less than twenty-four hours, the 2012 Summer Olympic Games will officially come to a close. 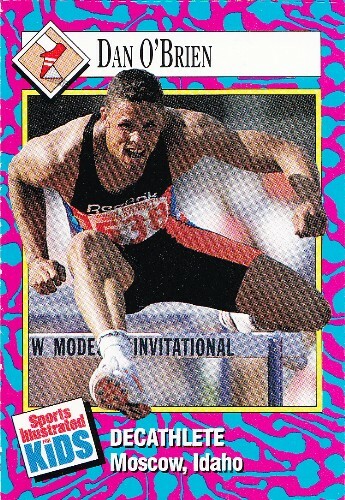 So I figure I'd kill two birds with one stone and show off five of my favorite Olympic athlete cards from my recent Sports Illustrated for Kids card collection purchase. 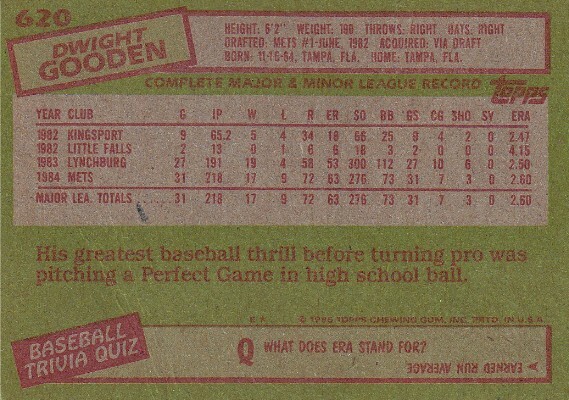 But before we get to the cards, here's a little background history on me and SI for Kids cards. When I started teaching back in 1998, I purchased a subscription for my classroom library and immediately started collecting the nine card sheets inserted into the magazine. Since then, I've been a subscriber off and on... depending on whether or not I can find an affordable subscription rate. 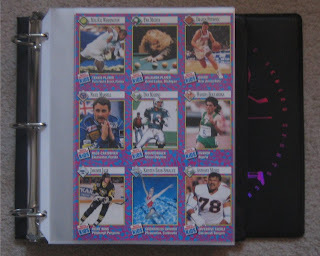 Then a few weeks ago, my buddy showed me a bunch of SI for Kids sheets he was looking to sell. The collection contained cards from the early 90's all the way through the late 2000's. I immediately showed an interest... and $10 later, I added fifty-eight new sheets to my collection. Unfortunately, the famous 1996 Tiger Woods sheet wasn't included. I'm not complaining though... since I doubt I'll ever find full 9-card sheets in bulk like this for less than 18¢ a piece. 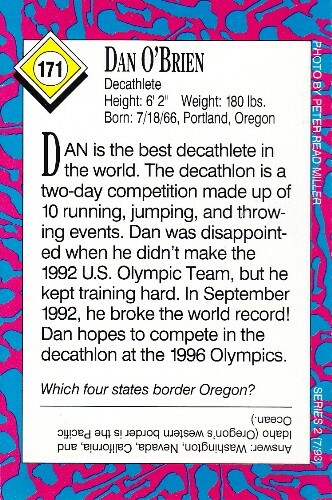 Anyone else remember Reebok's Dan & Dave advertising campaign? 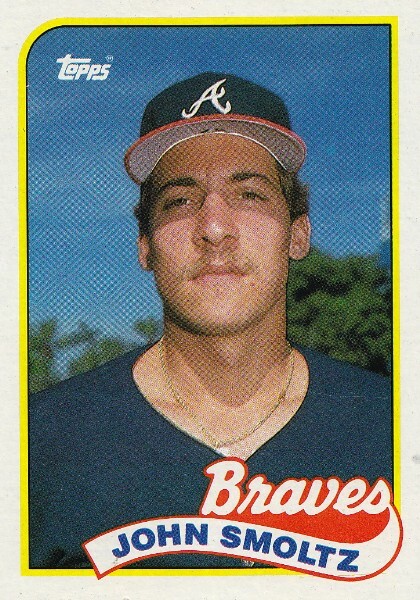 Mr. O'Brien failed to qualify for the Olympics in 1992... but won the gold medal four years later in Atlanta. Janet was a Bay Area household name during the late 80's & early 90's, because of her time at Stanford University and of course her four gold medals at the 1988 & 1992 Summer Olympic Games. 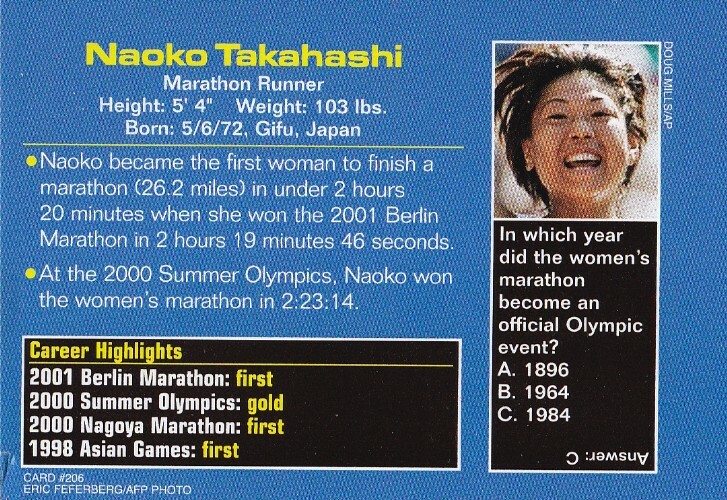 She's Japanese... she's cute... and until recently... she was the Olympic record holder for the women's marathon. 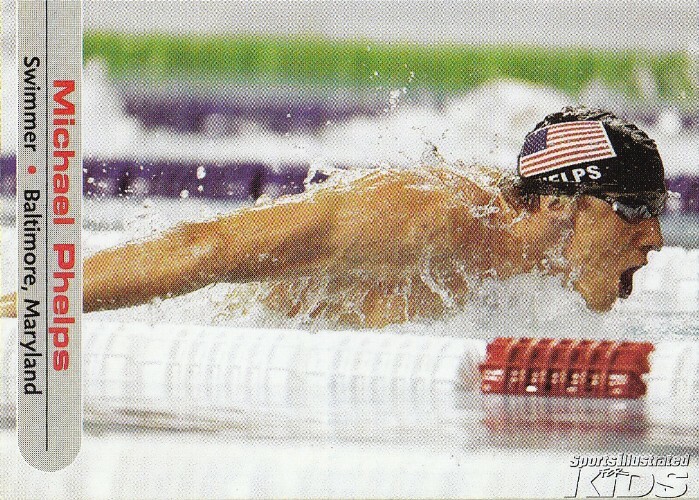 There's no way I could leave the most decorated Olympian of all-time out of this post. 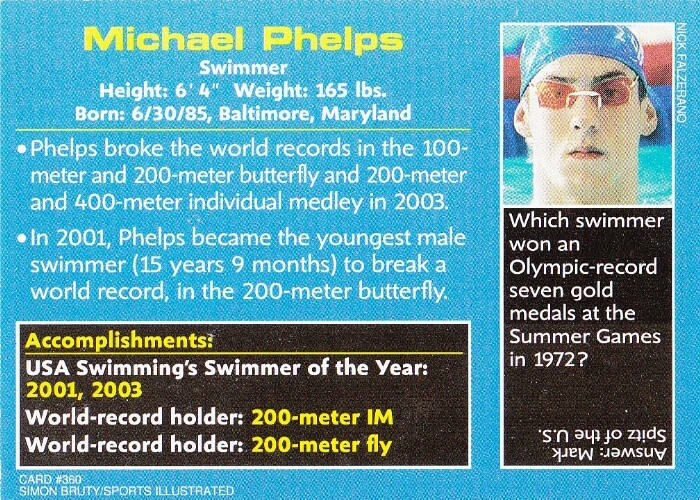 The guy has 18 gold medals. Insane. 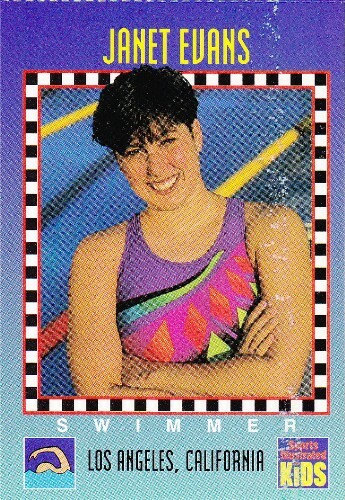 She might be a little young on this particular piece of cardboard, but there's no denying that she was one of the most attractive Olympic athletes in the 2012 games. Who are some of your Olympian crushes? I hope all of you are enjoying your weekend. Happy Saturday & sayonara! Nine Down... Four To Go!